Today was officially the longest stretch of time that I have been away from my daughter since she was born. I had two restaurants to visit in Glendale, so Cadence spent the day hanging out with her Nonna Dawn. According to Nonna, Cadence did really well. She had a great time playing and walking all over creation. There was only one meltdown during the day. Around the time the sun was going down, Cadence apparently began to notice just how long I’d been gone, and suddenly started throwing an all out I-don’t-want-anything you’re-trying-to-give-me-I-only-want-my-Momma fit, which lasted until Nonna and Poppa took her for a drive in the truck, up and down the canal, until she calmed down again. Thank goodness the tantrums never seem to last very long. It was strange being away from my girl today. I was busy with the interviews and photo shoots, but even the distractions couldn’t keep me from thinking about her, and really missing her. I found myself trying to finish up as quickly as I could so I could hurry back to see her. It just feels like there is something missing when she’s not around. It makes me wonder how my husband is really handling having us both gone for a week. After two bottles, and a whole lot of rocking, singing, humming, whispering, swaying, and pleading to please please please go night night, Cadence was hell bent on making sure I didn’t put her down. 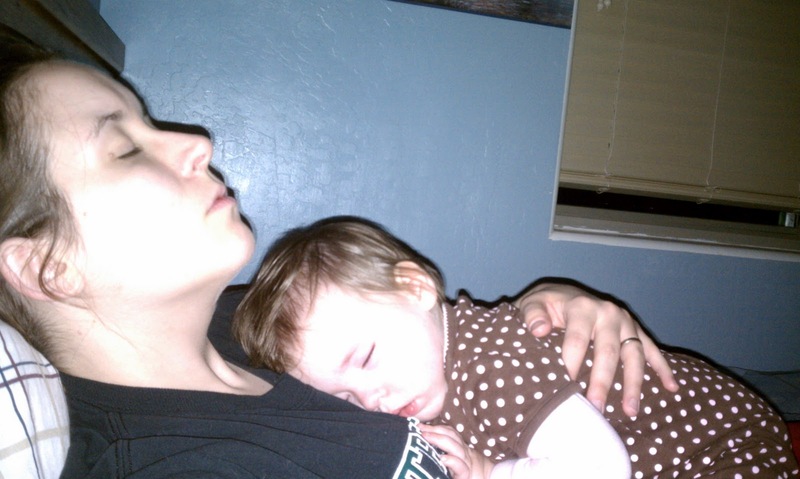 Even when she would fall alseep and go limp in my arms, the minute I tried to put her in her bed to sleep, she would wake up flailing and clutching my shirt with an iron grip. She wrapped her little legs around my arm and screamed bloody murder. After trying to lay her down a dozen times with the same result, I finally just lounged back on the bed and decided to call it a night. Looks like this is how we’ll be sleeping tonight. Night night my baby. Today’s 365 Project entry is dedicated to all the parents whose children are stuck to them like glue. Enjoy it while you can.